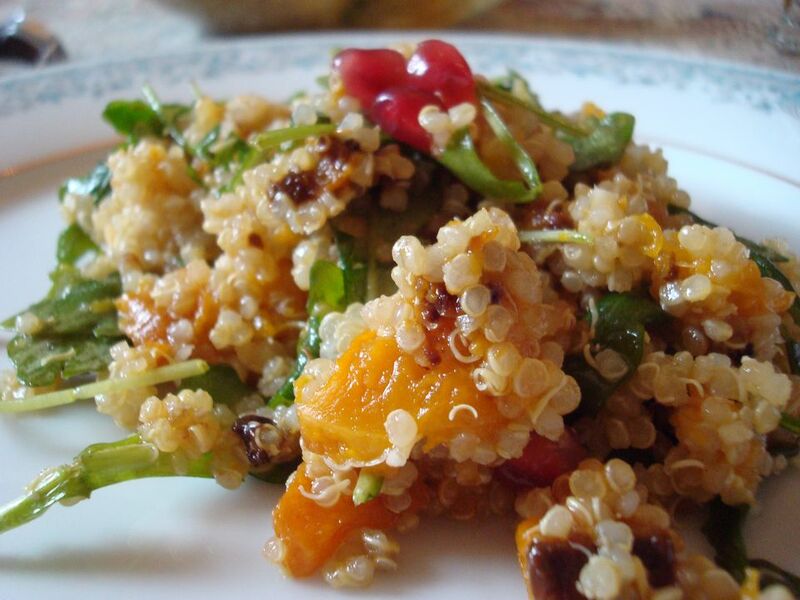 This quinoa, arugula, and butternut squash salad with citrus vinaigrette was originally created as a festive vegetarian dish to serve at the Passover Seder. But it's so versatile -- and delicious -- that it has become a year round favorite for everything from Shabbat and holidays to casual get togethers and barbecues. It's also an ideal addition to Rosh Hashana menus -- the squash, pomegranate, and honey are all symbolic foods for a sweet new year! Serve it as a vegetarian main dish salad, or as a side dish for meat, poultry, or fish. Pomegranate arils (seeds) make a beautiful addition, but if you can't find them, orange sections, sliced fresh peaches, or avocado would be great, too. Place the butternut squash cubes in a large roasting pan or baking dish and drizzle with 2 tablespoons of olive oil. Toss to coat. Spread the squash cubes into a single layer. Roast for 20 to 25 minutes, stirring once or twice, until the squash is tender and beginning to brown. Remove from the oven and set aside. While the squash is roasting, make the quinoa: Warm 1 teaspoon of olive oil in a heavy medium saucepan set over medium-high heat. Add the quinoa, stirring with a wooden spoon or spatula until toasted, about 1 to 2 minutes. In a small bowl or pitcher, whisk together the lime juice, orange juice, olive oil, honey, garlic, cumin, and salt. Pour over the quinoa salad and toss well to coat. Garnish the salad with the pomegranate seeds (if using). Serve warm, at room temperature, or chilled. Enjoy! Some Ashkenazim consider cumin kitniyot, so if you're making this for Passover, it's fine to omit the spice. If you do use cumin, the Pereg brand offers good quality and is certified kosher for Passover. Regarding quinoa for Passover, the Setton, La Bonne, Natural Earth Products, and Pereg brands will carry OU-P certification for Pesach 2017; Per the Star-K, while reliable Passover certification is required for most brands, the Ancient Harvest brand is fine with a regular Star-K symbol and a “Best By” date of 2/01/19 through 2/28/19.